The Annual Santa Bar Crawl 2018 by Lux Crawl is taking place on Friday, December 21st. Running from 5pm till 2am it will incorporate everything needed in order to truly get into that festive cheer. 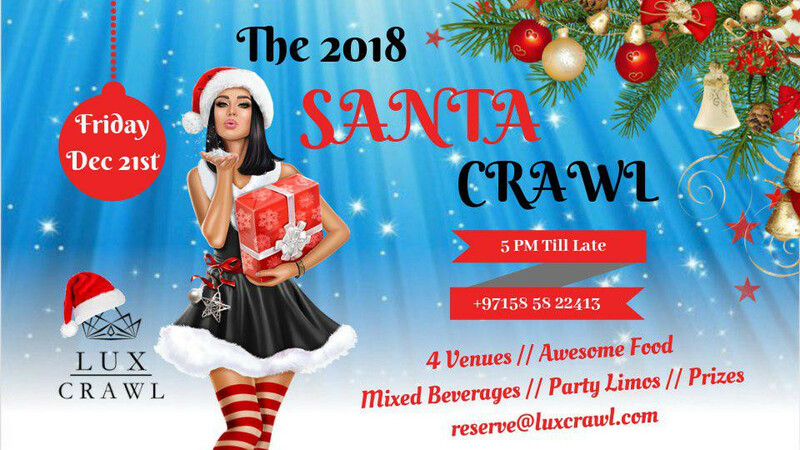 On this epic Santa Crawl you will tour across 4 of Dubai’s bars taking you on a Xmas whirl across the city, incorporated with luxury limousines, specialty cocktails, festive games, santa power hours (all access baby), epic prizes, food, santa hats, and your own Santa party guides to join along the way. The party kicks off in the much loved Souk Madinat Jumeirah, on the chalet style terrace at the vibrant bar and restaurant, Publique. From here the Santa festivities shall commence, getting an assortment of festive themed beverages which will guarantee to boost anyone’s holiday spirit. With further destinations, or ‘Santa Stops’ to be made across Folly by Nick and Scott, the go to favorite Tribeca for an Ultimate 'Santa Power Hour', as well as Lucky Voice, you will get to sing and dance your way into the late hours of the morning with true festive cheer. So pop on that santa outfit, or festive sweater that grandma knitted, and join on this ultimate Santa Bar crawl. Perfect for those looking to celebrate the festive season, ride around in limos wearing santa outfits, check out some awesome bars, and have a jolly good time in the process. For AED 499, you will receive Specialty Cocktails (across all locations), Luxury Limousine Access in 'The Santa Sleigh', Power Hour (Food & Bev) 1 hour free karaoke session, santa hat, games, prizes, all access food, surprises, and much, much more. Bring you and your friends and lets have a true Xmas party to remember! Reserve your place on Santa’s sleigh, and prepare for the ultimate Santa Bar Crawl!